The trip is planned for early September. It is now 7 weeks before boarding the airplane. Time to get myself ready to schlep suitcases, take long plane rides and walk long distances. As a fitness trainer I’ve developed travel plans for clients, and many for myself. 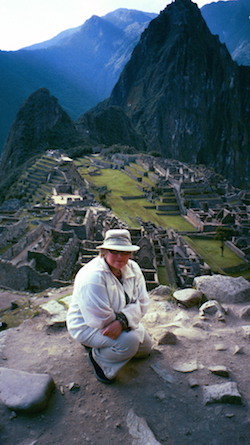 The personal trips included climbing the many steps of Machu Picchu, navigating the very uneven terrain in the Galapagos Islands and hiking up steep Amazon river banks. My clients have learned training techniques that helped them surf and snorkel, reach the base camp of Everest, walk the West Coast Trail carrying 40-pound backpacks, and more. The formulas used to develop these individual programs were used to organize overall exercise routines based on the goals and level of activity already in place. FITT stands for frequency, intensity, time and type. Another formula is SMART, which stands for specific, measured, action oriented, realistic and timed. The latter formula says almost the same thing as the first except that it adds the important component of being realistic (R). What every formula you use, it’s good to start slowly. Give yourself time to build up to fit and strong. Besides, it’s nice to feel smart. FREQUENCY – Stands for the number of times the program will be done in a one-week period. INTENSITY – Mild, Moderate and Hard are examples of the way we use intensity. Do you need every workout to be hard? It’s best to include a variety of intensities into your exercise plan. TIME – How much time do you have for each session? TYPE – What kinds of activities will be used? REALISTIC – Be reasonable and work up to that heavy weight, extra rep or level of intensity. Take into account your daily routine and plan accordingly. Next week I will spell out how I've built my FITT for Travel plan.